The last ever Mitsubishi Eclipse has rolled off the production line and will be later auctioned off in Illinois. The last Eclipse is a bespoke model, powered by a 3.8 litre V6, featuring a Special Edition package, 18” Dark Argent alloy wheels, unique graphics, sunroof, leather interior, 650 watt Rockford Fosgate 9 speaker audio system w/Sirius XM, Bluetooth, rear view camera and bi-xenon headlights. When the Eclipse first launched in 1989, it attained cult status with 980,000 units sold and was one the biggest selling coupés on the market. 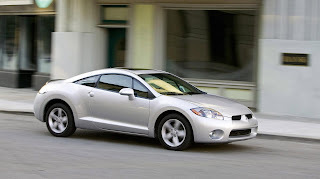 Mitsubishi described the process of the Eclipse as moving from a “sleekly-styled, turbocharged 4-cylinder boy racer model” to a “sophisticated yet distinctive-looking two-door,”. The money raised from the sale of the last Mitsubishi Eclipse will be donated to the Japanese Red Cross, which continues to aid victims of the Japanese earthquake and tsunami.